(PRLEAP.COM) San Diego, CA Dec 3, 2018: ConsuNova, Inc. releases Version 7 of their DO-178C Templates and Checklists with a promise of higher efficiency and DAL targeted models/modules for clients. Use of industry proven templates and checklists has long been considered a cost effective solution for any safety-critical systems development. The ultimate goal of ConsuNova DO-178C and DO-254 Templates and Checklists is to provide clients with a product that will expedite their project's certification efforts. There is a lot more going on under the hood however, and one variable is certain when it comes to obtaining FAA/EASA certification or compliance, that is complexity. Each iteration of certification templates and checklists that is released undergoes rigorous collaborative tailoring from multiple ConsuNova designated engineering representatives (DERs). The framework required by the industry demonstrates more plasticity than one might assume, which is why ConsuNova makes an effort to continually innovate their products and services. Old school meets new school in the digital age as ConsuNova uses technology to consistently gather feedback from clients and industry. The majority of ConsuNova's DERs are 20+ year veterans, each culminating knowledge from every project they collaborate with. Version 7 of ConsuNova's templates and checklists blends these two sources of learning to create a fresh pinnacle for the avionics and aerospace industry. Customers can expect V7 of DO-178C Checklists to be 35% more efficient with significantly less questions without jeopardizing their ability to substantiate DO-178C certification to their respective authority. Reza Madjidi, ConsuNova CEO and FAA Consulting DER, adds, "We listen to our client's feedback very closely and V7 of our DO-178C Certification Package is the upgraded product demonstrating our ability to be a "true consultant" rather than the usual "contractor"! We take proud to acknowledge the areas of opportunites and the needs to improve. Many new-commers to DO-178C compliance under estimate the effort to craft a workable and acceptable (by certification authorities) set of process plans. The optimists think a 4-week planning is adequate, yet the average time is about 8-week. Our client will truly and effectively benefit from this improved package expediting their DO-178C planning process by at least 30%." The V7 is customer centric and has come to fruition through the integration of feedback ConsuNova has received from the aerospace industry while performing DO-178C Gap Analysis and DO-178C Training. ConsuNova is thrilled about the release of its optimized DO-178C templates and checklists Version 7. 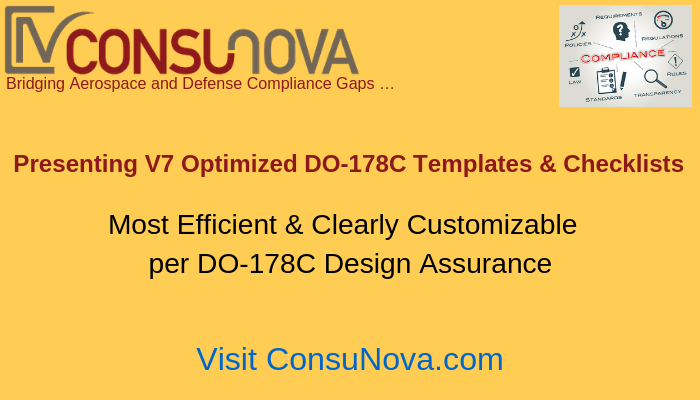 ConsuNova's V7 of DO-178C Templates and Checklist becomes available on Dec 10th, 2018.